What are these animals fed? They are fed grain and grass hay, as well as fresh produce. Why raise miniature Hereford cattle? Miniature Hereford's have a lot of benefits. First, their personalities make them unique and easy to train. They only need half of the pasture that a standard cattle need. Miniature Herefords are simply wonderful to be around. 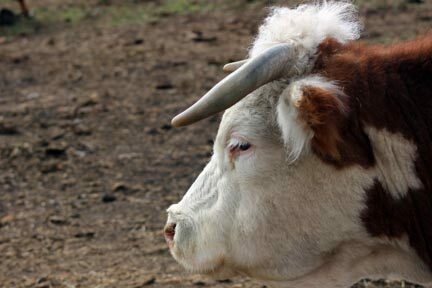 Their calm demeanor helps them to get along with other cattle and also helps to keep the other cattle settled. Second, they are easy to breed and calve. This makes them much more productive and we don't have to worry as much about losing calves - which makes it easier on us, as well as the cow. Can a miniature Hereford be a market animal? Yes they can. Our 4H steers at the Western Montana fair finish at a live weight of 750lbs on average. The meat that comes from these animals is leaner than that from regular, full sized beef cattle. There tends to be less hamburger and more sirloin cuts, which means better quality meat. Because the animal is smaller, the amount of meat also tends to be more economical. For example, it takes an average family of four around two years to use up all the meat from a full sized animal. With a miniature, this time is reduced to one year. This means you get fresher meat with less chance of loss due to freezer burn in the long run.